In 2017, Quantified Ventures, and its partner Meals on Wheels America, led the structuring of the world's first Pay for Success (PFS) project with a large Medicare Advantage (MA) plan as Payor. This initiative presented an important opportunity for Meals on Wheels America to scale its service delivery to homebound seniors, and for the MA plan to develop a new home-delivered meal benefit in conjunction with other supportive services for its enrollees. The intervention delivered through this innovative partnership was to be financed through a PFS transaction. Impact investors were to cover the upfront capital costs to scale the intervention, with the MA plan agreeing to repay investors once targeted outcomes were achieved – in this case, reductions in emergency department and hospital utilization. 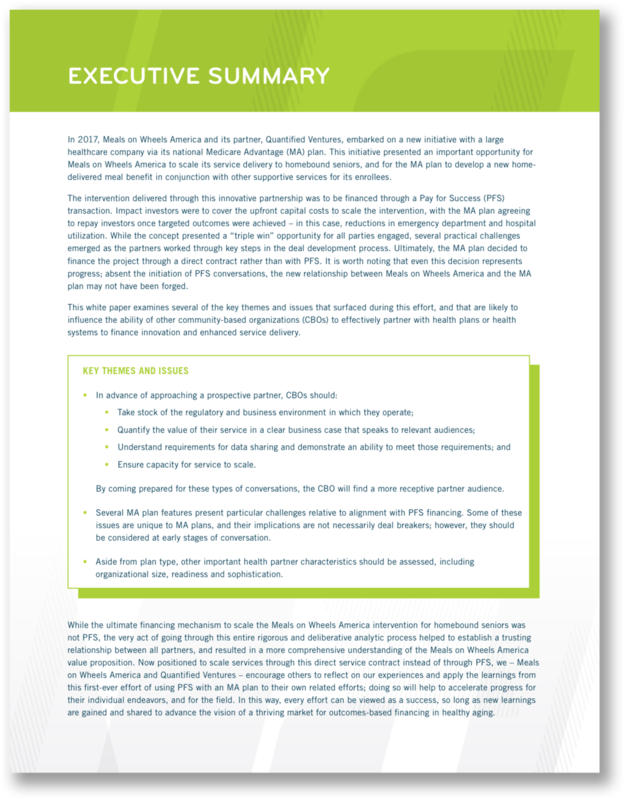 While the concept presented a “triple win” opportunity for all parties engaged, several practical challenges emerged as the partners worked through key steps in the deal development process. While PFS was not ultimately the financing mechanism used for scaling this Meals on Wheels America intervention for homebound seniors, the very act of going through this rigorous and deliberative analytic process helped to establish a trusting relationship between partners, and resulted in a more comprehensive understanding of the Meals on Wheels America value proposition. With this foundation in place, the MA plan decided to finance the project through a direct contract, resulting in service delivery to thousands of additional seniors. It is worth noting that even this decision represents progress; absent initiation of PFS conversations, the relationship between Meals on Wheels America and the MA plan may not have been forged. This white paper examines several of the key themes and issues that surfaced during this effort, and that are likely to influence the ability of other community-based organizations (CBOs) to effectively partner with health plans or health systems to finance innovation and enhanced service delivery.